Palomar Modular Buildings completed three swing space modular office buildings to support construction operations at the National Bio and Agro-Defense Facility (NBAF). The NBAF project is a joint construction venture between McCarthy Construction and Mortenson Construction. Site development for the new facility in Manhattan, Kansas has begun; construction is expected to be completed by December 2022. The temporary swing space modular buildings will provide the construction companies with a total of 14,624 square feet of office space for the duration of the project. 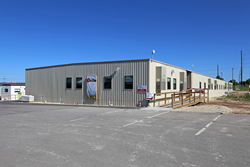 The value-engineered modular buildings feature durable, low maintenance finishes and surfaces that will withstand the high Kansas winds and harsh construction environment. The NBAF will be a state-of-the-art, biocontainment laboratory for the study of diseases that threaten both America’s animal agricultural industry and public health. The NBAF will be constructed and operated on a secure federally owned site on the northwest corner of the Kansas State University, adjacent to the university’s Biosecurity Research Institute in Pat Roberts Hall.